Who says you can’t enjoy a full English breakfast when you’re eating a plant based diet? 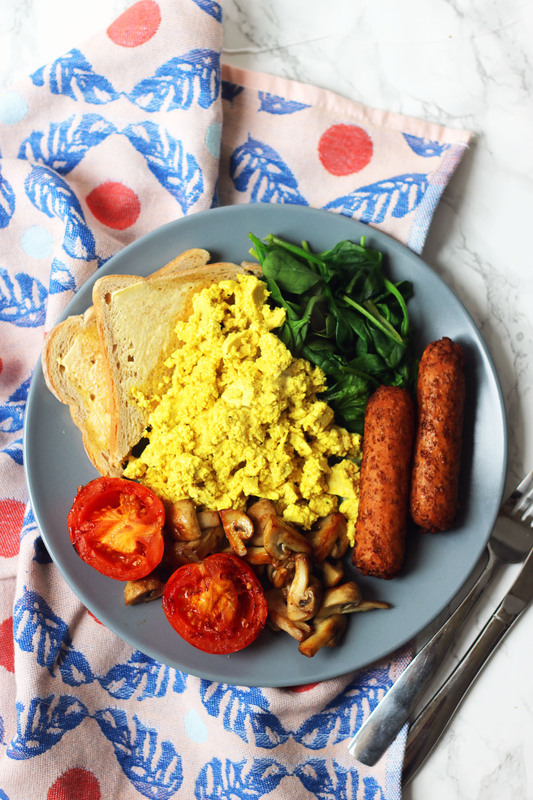 This Vegan Full English breakfast includes veggie sausages and tofu scramble so you don’t have to miss out. Having eggs for breakfast at the weekend is somewhat of a ritual in this house. Often on a Sunday we will wake up late, potter about in our PJs and whip up some eggs. Poached eggs and asparagus on toast are a favourite, as is a fried egg, spinach and gruyere roll. And don’t get me started about shakshuka! I also love quick and easy scrambled eggs. Made with tonnes of butter and a decent pinch of salt and pepper. I knew that once I ditched eggs and dairy scrambled eggs were going to leave a gaping hole in my weekly meal planning. Luckily, some hungry person a few years ago decided that they’d mash up some tofu, tint it yellow with some turmeric and call it scrambled egg. I was dubious at first but, when I woke up ravenous after a night of drinking and craving eggs, I was willing to give it a go. With the help of Flora dairy free, the other key components of a fry up can easily be made vegan – wilted spinach, sauteed mushrooms, grilled tomatoes and a couple of slices of toast taste rich and buttery. Of course you’ll need some sausages too. Pictured here are Linda McCartney sausages but you can swap them out for your favourite vegan brand. I wanna spend a few minutes back on the subject of tofu scramble. A lot of people seem to have some sort of aversion to tofu even if they haven’t tried it. I think it’s because it’s a really underused ingredient that people just don’t know how to cook it. For a start there are lots of different varieties of tofu. Silken tofu will completely disintegrate if you attempt to mash it up. A firm-silken tofu will get you a creamy texture but still holds its shape a little. If you like your (regular) scrambled eggs quite loose and soft then this is the right type of tofu for you. If you like your eggs a little more cooked than regular firm tofu will be fine. Once people get over the texture, tofu is then accused of being tasteless but that just makes it the perfect flavour carrier for dishes like this. With some clever seasoning (mainly thanks to black salt and nutritional yeast) you can actually recreate an egg-y flavour. That’s the texture sorted, and the flavour. All that’s left is to add a little turmeric and suddenly your scrambled tofu has a lovely sunny yellow colour too! Mash up the tofu roughly with a fork until it resembles scrambled egg. Melt the oil and dairy free spread in a pan in a sauce pan. Add the tofu and cook for 5 minutes until it releases some of its liquid. Add the nutritional yeast, turmeric and black salt to the tofu and stir until the tofu scramble has all turned yellow. Cook on a low heat while you finish making the rest of the breakfast. Cook the sausages according to their instructions - if you have the option of frying or grilling I prefer to cook mine in the grill. Heat the oil and dairy free spread in a griddle pan. Season the tomatoes then place them into the griddle pan flat side down. Cook for 8-10 minutes until the tomatoes have softened. In the same pan, add the mushrooms and season well. Cook the mushrooms alongside the tomatoes, letting them get slightly crispy on the outside, stirring occasionally. Toast the bread to your liking, and spread with a little dairy free spread. Plate up the toast alongside the sausages, tomatoes, mushrooms and tofu scramble. Immediately before serving add the spinach to the sauce pan and season well. Stir until just wilted and serve. If you’re look for more plant based recipes then check out my #Veganuary archives here.